Can we agree that for the beginner or average blogger, Search Engine Optimization (aka SEO) is confusing and hard? I’m going to go with a big yes. Especially for me. But recently I learned techniques that can boost your SEO (after avoiding SEO like the plague for 3 solid years)! I read one post, which lead to a video, which lead to approximately 25 more videos (thank God for YouTube)! I’m going to walk through the things I learned over the last month while knee deep in SEO content. 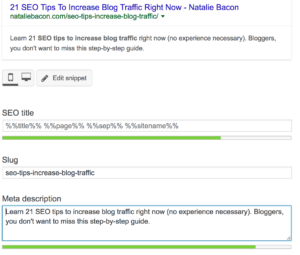 I’ve come up with 21 SEO tips to increase blog traffic right now. It’s by no means a treatise on SEO. But that’s why I think you’ll like it. This is a guide with SEO tips to increase your blog traffic right now – something for beginner bloggers who know better than to avoid SEO, like I did for so many years. FYI, this post is specifically for Google and WordPress users (not Bing or any other search engine or blog platform). First, you really need to understand that Search Engine Optimization matters, even if you pretend it doesn’t (I’m preaching to myself here). It matters because people use Google to find content. If you want people to find your content, then you need to use SEO. It’s another way to diversify your traffic. I’m a huge fan of social media traffic, but that’s not enough. You need Google, too! If you want to optimize SEO on Google, you should think “what would people be searching for” and not “I’m going to write a post about XYZ that someone may never find.” That’s not to say writing about your opinions or ideas is bad. But if people aren’t searching for that topic on Google, then you’re not going to be found. Also, note that Google uses 200+ signals to rank your page. All of these are different, and I go through several below. Just keep in mind that you’re doing each step in an effort to rank higher on one of the 200+ ranking signals. These signals can either be part of “on page SEO” (the words you include in your blog posts) and “off page SEO” (things outside of your posts, like linking). Just something to keep in mind! Once you understand what SEO is and how it’s important, you’re ready to move on. Now that you know SEO matters, you need to get all the technical stuff set up properly. Before you can focus on fancy things like keyword research, back-linking, and page optimization, you need to make sure you have the structural components of your blog set up properly so Google can actually find your site. To make sure you have everything set up properly, be sure you have 1) Google Analytics installed and 2) Google Webmaster Tools (Search Console) installed and tracking your site. You’ll use both of these sites to work on your SEO, so it’s really important you have these set up properly. Not only should you have them working, but you should also link your Google Analytics account with your Search Console account. This will allow you to see keyword info in Analytics. I thought for sure all mine would be set up right because my blog was running smoothly, but it wasn’t. So, double check! Next, you should install a plugin on your site that helps you manage the SEO on each page. I use and recommend Yoast (this is pretty common and highly recommended by a lot of bloggers). It’s a free plugin within WordPress and very easy to use. Yoast provides on-page content analysis, XML sitemaps, and other awesomely helpful features. You can connect your Search Console account to WordPress through Yoast, too (literally, I just found this out today, so make sure yours is setup – I had no idea you could link the two). Do this by clicking on SEO in WordPress in the left column of your WP panel, then go to the Search Console tab and follow the steps to link your Search Console account to Yoast. The benefit of doing this is now I can see data inside Yoast in WP instead of having Search Console up in a browser all the time (especially for identifying 404 errors). Now, let’s make sure your sitemaps are working. A sitemap is a file that contains the list of pages and posts on your site and how they’re all organized. This tells search engines, like Google, how your site is organized and all the pages on it. You can also find your sitemap in WordPress if you use Yoast by going to SEO → XML Sitemaps. 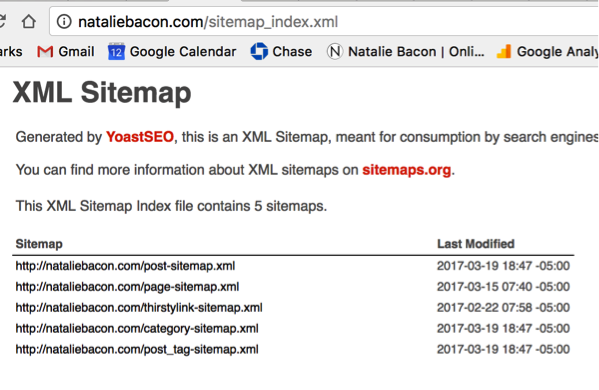 If you go to BLOGNAME.com/sitemap_index.xml and you get a 404 error, you do not have your sitemap working properly (assuming that you’re using Yoast). This is a must for SEO. Once you have everything set up correctly (i.e. : you’ve done steps 1-4 above), you can start digging into your blog to make sure it’s optimized for SEO. In this step, focus on removing duplicate content. Duplicate content confuses the robots that crawl your site. For example, if you have multiple pages with the same meta description, this is seen as a duplicate piece of content (which is not good in Google’s eyes). Also, if you have images that have the same file name, this is duplicate content. You can see duplicate meta descriptions and title tags here. Fix this content so you remove the duplicate content. There are probably other ways to figure out how to remove duplicate content through plugins or other paid-for sites, so those are options, too. The point here is to avoid duplicate content and remove it as soon as you identify it. When a robot crawls your site, if it goes to a link that is no longer working (e.g. : you deleted a blog post), the robot gets a 404 error page. Similarly, if a human goes to a deleted page, she will also get this 404 error. The crazy thing is that robots see the weirdest 404 errors that readers would rarely ever get to. But, the only thing you need to worry about for SEO is that 404 errors are a negative when it comes to SEO, so you need to redirect them. A few 404 errors is okay, but hundreds is not. If you have your Search Console linked to WP, then you will see the 404 errors there, too. Once you have identified the 404 errors, redirect them using a redirect plugin. I use Quick Redirects, a free plugin that allows me to redirect one link to another. When I first started paying attention to this, I redirected over 300 broken links! It was not fun. I had no idea I had these and I didn’t care at the time. By redirecting any 404 errors, you will increase your SEO with Google. Google makes algorithm updates all the time. Recently, with the increase use of mobile users, Google has penalized sites that have pop-ups on mobile. If you want to do the best for your SEO, then don’t have a pop-up. I have decided to keep my pop-up because I value my email list more than I do the boost I would get without the pop-up. The rate of return isn’t worth it for me personally. The point is to know that having a pop-up will decrease your SEO juice. Your site speed affects your SEO. Google penalizes slow websites. To check your site speed, use Google PageSpeed Insights. On this page, enter the specific URL you want to test (e.g. : your home page or a specific blog page). You will get feedback from Google with things you can fix. A lot of it may sound like technical jargon, so if you can’t fix it yourself, talk to your tech person. This is what I did, and I had Grayson Bell from iMark Interactive increase my site speed by doing a few things for me (he’s the best at this stuff!). One of the biggest influences of SEO is how many links go to your site. This is because the more links that go to your site, the more Google views your site as an authoritative site in your niche. There are many ways to get links back to your site, including: 1) guest posting on other blogs, 2) creating a second site yourself and linking back to your first site, and 3) asking other sites or bloggers to link to your site (either for pay or just because it’s a good resource). There are tons of different ways to get more links, but the emphasis here is that links matter. The more links pointing to your site as an authority, the better. Images in a post are a good thing for SEO. And the more images in a post, the better. The reason images boost your SEO on a page is that images are another place within the post where you can use your keyword. That’s why you should include your keyword in the file name, title name, and alt tag. If you don’t, Google won’t know what the images are and you won’t get the SEO boost. But if you do include this information (and make the file name, title name, and alt tag relevant to your keyword), Google will include it as more SEO juice for your keyword. Above the fold (i.e. : the top half of your blog post), you should use smaller images with text wrapped around the image. This means that instead of having a pretty image that spans the whole width of your post, consider using a small or medium sized image at the top of the post. The reason smaller images are better is that people actually stay on the page longer with smaller images at the top because they start reading your post right away. I use Haute Chocolate, Deposit Photos, and iStock Photos for all my images. I had no idea this was the case and had full width images in all of my posts. After learning this, I went back through hundreds of posts (each and every page on my blog) and changed out the image from a big, full-width image to a small one. Obviously, consider your niche and make the decision that’s best for you. If you’re a fashion or food blogger, you may not want to do this because images matter so much more to your content. Another big SEO boost is infographics. People love them. These will also help with SEO. Nowadays, your posts should be a minimum of 1,800 words to rank high with SEO. 2,000-5,000 would be optimal. This is new to me – something I learned over the last month during my SEO research. It used to be that shorter posts that were posted more frequently on your blog were better. But with the new algorithm updates, that’s not necessarily the case for purposes of SEO. Keep in mind that this is for purposes of Google rankings — not social media. So, if you get most of your traffic from social, then you may want shorter posts. The key is to know which works and what your goal is. Backlinko is a great example. His entire blog has under 40 posts, and he consistently ranks the highest for SEO terms. Now, if you post more frequently and you have a following already, your following is surely more likely to come back to your site frequently if you have new posts published more often. But for SEO purposes, the amount of posts on your site and the frequency of posting new content isn’t important. One rule of thumb for landing pages (i.e. : those pages that you have static content on – not blog posts) is that they should be at least 500 words. This is shorter than what I was doing, so I went back through all my pages and made them a bit longer. Just like with #12 and #13 above, the point is to focus on quality and not quantity. Longer, more in-depth content that is amazing should be the focus instead of publishing often for SEO purposes. I still like posting consistently because my long-time readers know they can expect new content on Monday mornings. But, for increasing SEO, I’m relieved to know I don’t need to start posting more frequently. People love actionable content. If your post gives people something to do, it will be more popular on the internet. This doesn’t mean make all of your content actionable, but it does mean that you should consider making some of your best content actionable for your readers (assuming you want it to be popular). Now, we’re going to talk about keyword research. This is a very important part of SEO, so I’ve broken the step up into 4 parts. You need to set up your blog posts with the right words so that people can find it when they search Google. This is a big one for SEO. So, pay extra attention to this step. The “keyword” in a blog post is a phrase you want to identify as being the main point of your post. Using Yoast, you can put that keyword in several places (headings, titles, meta descriptions, alt tags in images, etc.) — more on that below. Because the internet is now such a competitive place, you need to do research ahead of time to determine which keywords to focus on in your blog posts. You can find keywords for free by typing in words into the Google search bar and seeing what Google prompts you with the finish the phrase (this is a way of seeing what is popular and what people are searching for). But you won’t find any data on the searches. You won’t know how many people are searching for that word. So, using this method you can’t know whether it’s a good keyword to use. So, the next step is to use an online service to do keyword research. There are many companies out there that offer keyword tools, including Google Adwords Keyword Planner, SEMRush, and Long Tail Platinum. It’s pretty standard to use a service to do Keyword research — especially Google Adwords Keyword Planner. Despite knowing this, I’m just now starting to get into using a service. I suggest not waiting three years into blogging and starting with at least AdWords asap! I’m a little behind to say the least. 🙂 I did sign up for AdWords recently. You do have to enter your billing information, but you can immediately pause the campaign (I did a $1/day budget and immediately paused it once I signed up). After doing this, I had access to the Keyword Planner to do my keyword research. Here’s an amazing article on Google’s Keyword Planner. You can also use something like LSIGraph.com to figure out what variations of your keyword you should use throughout your post. You can only reference your keyword so many times, but you can include other variations of it. The more of these variations in your post, the better for SEO. You should also consider using long tail keywords (3-4 keywords or longer phrases), which are less competitive (i.e. you have more of a chance to rank for them). Average monthly searches – how many people are searching this keyword. The higher amount of monthly searches, the better the keyword. This is shown in AdWords. Suggested bid – how much competition there is for this keyword for people paying for ads. The higher the suggested bid, the more likely people will convert into paying customers (Backlinko calls this commercial intent). This is shown in AdWords. Competition – how competitive is the keyword to land on the first page of Google. Learn how to identify competition in this article. Long Tail Keywords – longer keywords that give you a better chance of ranking on the first page of Google. Find long tail keywords by searching something in Google and seeing what else pops up after the keyword. You can also scroll to the bottom of the page where it says “searches related to…” to find more long tail keywords. Then, you can use these in Adwords as the original keyword to get more info on them. Once you have your keyword chosen, you need to use it in your post. Once you have your keyword, you need to put it into your post. Keyword research and placement is its own topic (just search YouTube and see how many videos you can find). The point here is to get started using it (and not avoiding it, like I did). Generally speaking, a shorter slug (url, permalink) with 3-5 words (including your keyword) is recommended for optimal SEO. Avoid short, stop words (e.g. : is, the, on, for). I pretty much never follow this rule because I have keyword issues (meaning I have yet to figure keywords out completely, which means my keywords are typically longer than 3-5 words). But it’s common knowledge that a shorter slug is better. Backlinko, one of my favorite authorities on SEO, introduced the the Skyscraper technique to increase your SEO. The point of the skyscraper technique is to get your post on the first page of Google for the keyword you want. In fact, if you watch the video I just linked to, you’ll be hard-pressed not to try this and see if it works. Find content that’s authoritative on Google in your niche and ranking for the keyword you want. Build a better post by a) making it more thorough and longer, b) making content more up to date, and c) making content better designed. Promote your post by emailing people and tell them your stuff is really good and they should link to it. While the phrases above are from Backlinko, the strategy in general is a copywriting strategy that copywriters use a lot. The point is that if you get readers to stay on your page longer, Google thinks you’re more of an authority and will rank you higher. So, take time to look up ways for you to use phrases that encourage readers to stay on the page anytime you think they’re likely to leave. Headings help Google know what your post is about. The H1 tag is for your title (so it’s whatever you put in the WP title box. The next best tag is the H2 tag, which you should use for your headings within a post. Breaking up your text with useful subheadings will encourage readers to stick around longer. Not only that, but if you can include a keyword in your subheading, Google will like it. It’s well known that including links in your posts is a good idea for SEO purposes. Be sure to include links to your own content and links out to third party site. 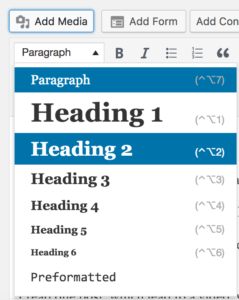 Backlinko recommends 2-3 links per 1,000 words. Breadcrumbs and tags show readers where things are, but more importantly for SEO, they help search engines determine the structure of your site more easily. I had Grayson Bell from iMark Interactive put these on my site, so if you need a tech person to do it for you, use him. A lot of the tips listed above are different than what I was previously doing. If that’s the case for you, don’t go back through every single blog post to change them if it’s too cumbersome. Instead, take the top 10 blog posts on your site and make the changes to those. You’ll get the biggest bang for your buck. I will say it’s much easier making sure content is SEO friendly going forward than it is fixing old content. That’s why you should learn this stuff now. Fixing everything is a pain. That’s a wrap! Happy blogging! Yoast is awesome, just by using this plug-in, I’ve seen an uptick in my search engine traffic. In addition, the readability of my posts is much better! Thanks for sharing – I’d be surprised if this post doesn’t shoot up the rankings! This is a mega post!! You’ve given some great tips that I’m going to implement right now, as I am going through the SEO assignments in EBA. Perfect timing! It is sooo large haha! I couldn’t help myself. When I took EBA I barely did any SEO – totally regret putting it off for so long. Hopefully this post with that course helps you master it quick! I too have been avoiding SEO. Thanks for sharing your awesome tips! I’ll start implementing some of these this week. ? Good luck, Martina! I hope this helps! Amazing post, Natalie. So useful and digestible. Thank you! For my first 8 months of blogging I also was in SEO denial. Looking back at some of the keywords I would use in my Yoast plugin is a mix of terrifying and hilarious. I’m really trying to focus on it lately and this is so helpful! Nice list, Natalie. It’s incredible how much influence we have over our own SEO. I had no idea a few months ago – I appreciate that so much more now! Hi, Natalie. Do you know any cheap keyword tools? I just can’t spend much money for it now. I found some free tools, but it isn’t convinient for me. And I found SerpStat – it’s quite cheap, still figuring it out. Maybe you have already tried it? Need your advice. Google Keyword Planner is free! You have to put in your billing info but then you click pause (I explain that above). I haven’t paid anything for it at all. Thanks for the information, great reads! Ha right?! Don’t we all!!! Very in-depth post. I’m in the process of doing a blog audit. Going through four years worth of blog post isn’t the easiest thing to do. I started using YOAST in 2016 and noticed a difference within a few months. Now, I just have to go back and update SEO for my 2013-2015 posts. It pays off, Jason – I recommend it! Hi Natalie, great post on SEO. I launched my blog just over a month ago and I am using Yoast which makes it so much easier. I also have Google Analytics and Search Console connected. I need to check if my site map is working correctly though and I haven’t looked into 404 errors. The WP template I got had some blog posts there and I’ve deleted them so I suppose those would be the 404 errors? Where would I redirect them to if those posts don’t exist anymore? That’s what I confused about. Also, didn’t know about those large pictures at the top. I guess I need to move those further down as I made some special ones for Pinterest purposes. I also didn’t know to use H2 headings – I sometimes use H3. Not sure why H2 is the one to go – I guess just because it’s the next one after the title? Lots of stuff I need to look into. Thanks for this great overview. I’m definitely saving this for future reference. Hi Kasia! That’s right. If you see a list of 404 errors in your Search Console under Crawl Errors, simply use a redirect plugin and redirect them wherever you want. I usually use my blog page as a redirect, but you can use any page you want. You can also change it (the plugins usually keep the list of what you’ve redirected so you can see what you’ve redirected at all times). After you redirect those 404 pages, when Google crawls your site again, there won’t be a 404 page at all. As for your question about headings.. I also always used H3. If you think about it as a hierarchy, it makes sense. H1 (your post title) is the most powerful. H2 is second most powerful, then H3, then H4 and so on. They’re not all treated equal. That’s why you want the keyword in your title (H1) and your H2 subheadings. Make sense? Hope this helps! Natalie, this was SO helpful! SEO is definitely something we’ve neglected a bit – we’re only using the Yoast plugin, but that’s it really. So, I think we’ll definitely be implementing a few of these things. Such a complex topic! Sounds great, Amanda! I’ve been using Yoast for years, but never did anything else so my keywords weren’t actually things people were searching for, which made my SEO attempt a big fail. Thank you for synthesizing all of this helpful information! The thought of trying to master SEO is so intimidating, but breaking it up into actionable steps makes it far less daunting. Awesome post, Natalie! I’m about to fix my top 10 blog posts. I’ve been putting off SEO because it intimidates and easily frustrates me. I felt exactly the same way. YouTube helped me a lot. Good luck!! I have been looking at SEO and blindly do random things on my Yoast plugin to make it orange or green. Truth be told I have no idea what it means. Might as well be a foreign language. I will have to start these tips but need to quit whining and just do it. Your details are awesome and I will start this weekend. Save Splurge Deny Debt – Cameron recently posted…Do you Talk with Friends about Money? That’s what I did for 3 years! Just tried to get that green light on Yoast. Really, my keywords were sentences that no one would ever be searching for so it didn’t matter than my on page SEO was good. Hopefully, this helps!! Great tips, Natalie. I love Brian Dean’s stuff and every time I reread it, I learn something new or remember something I had planned to do. I need to redirect more items for the 404 errors. I had done this in 2013 and back then, the standard plugins that made it easy didn’t work w/ my theme, so I had to go to the php file and that made me nervous. I’m hoping with my new theme, I can now do this. I have some of those issue + a few posts that I’ve been planning to combine and redirect for stronger content. BTW, the longer epic posts are not a new thing. It’s been like that for at least 3-4 years. It’s just now catching on with the masses and more people are learning about this. Of course, many still resist. You’re smart to do this. Also, BTW, there is a wonderful podcast on SmartpassiveIncome titled something like How I tripled my traffic by deleting 1/3 of my content. This has been on my “to do” list for over a year. So, hopefully after my theme upgrade. Debbie Gartner recently posted…Water popping hardwood floors – What is it, what are the advantages and when does it make sense? Thanks!! I am new to it, and it’s going well! Glad to hear you are doing it, too! 🙂 I’ve also done the site audit — I do it all the time actually! Always deleting and editing old content to keep it up to date. It helps with traffic for sure. I really love to read your blog as well as the examples that you’ve mention. Thank you so much for this helpful contents. I am looking forward to see more example contents like this.If you have time you can also visit this site that I managed to surf in business startups. Wow..great post Natalie. I learnt alot. I also love you site. It is well pruned and tidy..
What a compliment, Monika! Thank you!! Thank you so much for this article! It has helped me a ton! And super easy to understand for us newbies! Thank you so much, Brie! That was what I was hoping! Ugh, my site is still running slow even after I downloaded a crunch the images plugin. I’m not sure what the problem is. Thank you for the tips, I’m definitely saving this as a bookmark! Wow-I followed the steps and I did it. very easy to understand-thank you.Now I am working on my blogs to make them more SEO friendly. I will gladly follow these SEO Tips! I am new in SEO and I need all the tips that I can get. This post contains so many wonderful SEO tips. And I am sure, all these ideas will put a great impact on my SEO work. I must say, this post has everything what is required to increase valuable traffic for your website and to make your website more presentable for online presence. Thank you for sharing your splendid thoughts on SEO, it made our work more easier!! I had to bookmark your article and read it for 3 days to able to understand everything. Very thorough explanation! Will read more of your fresh and informative article tomorrow. Keep sharing! I don’t usually write comments, but I have to say that I’m very impressed by this post. I virtually assist in SEO/keyword research as well as have blog(s) and have been around the blogging world since 2011, but the information is spot on. I can’t tell you how many times I go to read a blog post from your everyday blogger about SEO, and they have it all wrong. So I wanted to give you kudos for giving out correct information. It irks me to read the wrong information that still gets put out there from well-intentioned bloggers. I also wanted to add backlink audits and regular SEO and technical audits are essential. As well as going over your old posts and updating for “freshness.” Interlinking is another thing. Either than that, I have found combining Yoast Premium with Squirrly SEO plugin to be very beneficial for many reasons. They complement each other well, and each offers things that the other does not have. With Yoast premium, you can aim for multiple keywords, interlink, redirect, etc. With Squirrly, even if you know nothing about SEO it gives you keyword suggestions. It also has rankings, audit information, etc. Rahul Tyagi recently posted…Does Website Speed Matters for SEO? If talking about outbound links, some methods are too aggressive and illegal in terms of SEO. What’s the difference between them and organic ones? Very well described article. I am a new blogger and i was looking information like this. Surely this will be helpful for me and i will bookmark this and share with my friends also. Thank you and keep sharing valuable information. Hope to read more valuable article form your site!